1. Power: 380/50HZ, 7.5A, 10A direct start,15A or more by the star delta startey. 2. The range of the motor capacity is 7.5~540HP. 3. The air exhaust pressure can be up to 15bar. 4. It is cooled by water. 1. 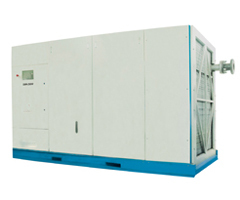 The screw compressor and the parts is of brand, with good quality. 2. It is super silence design. 3. It is high efficiency and energy saving. 4. It is time-saving diagnostics. 5. The usage is safe, easy and convenient. 6. It has the fuction of monitoring the compressor remotely. 7. It has intelligent control system with fingers. 8. The data is as the attached.